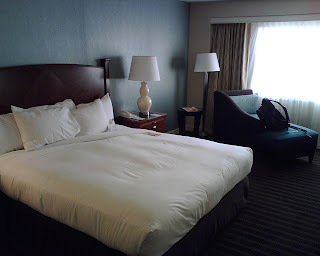 I am back in Boston Mass staying at my favorite hotel here, the Hilton Back Bay. They have renovated the rooms since the last time I was here and it's even nicer. This trip they put me in a balcony room on the 20th floor so I can step out and see the entire city. The carpet, furniture, bed and tv are all new. It looks really nice and there is high def plasma TV now. The lobby now has Starbucks which is wonderful in the morning when I am looking for my fix. The beds in the room are the best part, well that and the A/C works really really good and it gets really cold so I sleep well. The other best part is the water pressure which is like a fire hose when you turn on the shower which I love. The hotel is perfectly located, next to the convention center and all the shops and restaurants in the Back Bay area of Boston. I can see Fenway Park from my balcony where the Red Sox play baseball which is really cool. 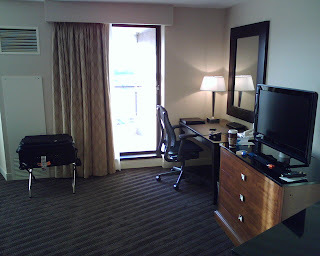 If you are looking for a place to stay when you are in Boston you can't go wrong with the Hilton, its a great place. I am here for three days after spending the last week pretty much doing nothing but flying here and there, from London England to Durham North Carolina to here and then on to Seattle later on in the week.